The number of kWh that I have used for EV driving has just surpassed the number of gallons of gasoline that I have purchased in my lifetime. Before you say it, I know these are not comparable units. Yes, they are both units that can be used to "fuel" a vehicle but they are apples and oranges. A gallon of gas will get you tens of miles. A kWh will only get you 3 or 4 miles. A gallon of gas is $3 or $4. A kWh is only about a dime. Additionally, the two vehicle types are radically different. So now that we know these are different, let's compare them anyway. I picked up my Nissan Leaf in May 2011. When I got it, I qualified for "The EV Project" program. This meant that I received a free charging station in my garage. It was installed about a week before the car arrived. When it was installed, I also installed a simple analog wattmeter (pictured below). This allowed me to count every kWh that went to the charging station. With all the fancy features my charging station has: WiFi, timers, data collection..., the charging station's standby power is not negligible. It can add up to about 100 miles worth energy each month, so not every kWh tracked by the meter was actually used to move the car down the road, but I did pay for these to fuel the car, so they are included in this "Wall-to-wheel" analysis. One more note, I have charged my EV in many other places. Obviously, my home meter does not track these, but home charging (typically overnight) is my primary recharging method. 6060 kilowatt-hours or 6.06 megawatt-hours used for EV fueling. I should point-out that our solar panels have made more than twice that amount since our EV first plugged in. If we had paid the standard local rate for this, it would have cost ~$600. With the Time-of-use plan that we are on, this reduced the cost to ~$388. That is not bad for 24,600 miles of driving over three years. Calculating my gasoline usage is pretty easy since I have only ever owned one gas vehicle. A 1997 Honda Passport. When I bought it, it had 6,000 miles on it and it now it has 102,000. My lifetime MPG for this vehicle is just over 16. This means that I have purchased 5900 gallons of gas. Computing the cost for this is not as easy. I have detailed record for 2010 and later. So for dates before this, I'll use the below chart to estimate the costs. When I bought the Passport, I was spending less than $500 a year on gasoline. 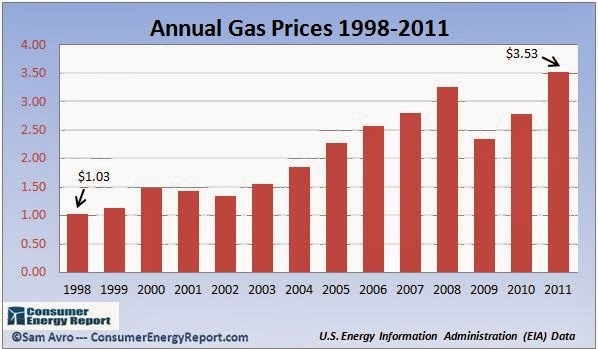 My gas costs peaked in 2008 at nearly $1500. This is when I started to drive electric. Adding the years up, I've spent over $12,000 on gasoline. So how much have I saved over these last three years? Assuming I would have driven the Passport for these 24,600 miles, I would have used more than 1500 gallons of fuel. At a price of $3.50 per gallon, that is $5,381. Subtract the electricity cost and I have saved about $5000. Electric car sales up in D.C. area: "Atlanta led the nation with more than 3,000 plug-in vehicle sales, a 52 percent increase, followed by Washington, D.C. Portland came in third, just ahead of Los Angeles, with San Francisco, San Diego, Chicago, Seattle, Miami and Detroit following close behind." As if we didn't have enough confusion and infighting in the EV world already, now there is another charging option. As reported in GreenCarCongress, the Chinese joint venture between Daimler and BYD (called BDNT) is working with ABB to create DC fast chargers for their upcoming battery electric vehicle. 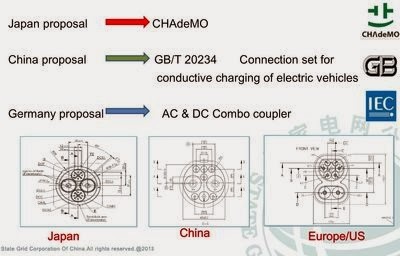 Rather than selecting the CHAdeMO standard used by Japanese auto manufacturers, or the Combined Charging Standard (CCS), aka SAE Combo, used by GM, BMW, and others, Daimler/BYD have decided to create yet another fast charge connector. And it has the very memorable name of GB/T 20234. Shouldn't there be a standard? The beautiful thing about standards is that there are so many to choose from. I have no plans to drive my car to China, so you might ask why would I care what type of fast charge connector they use? I have no direct concern, they can use whatever they want. However, there are secondary effects to consider. First, it complicates the landscape. There is already a lot for new EV owners to learn. As the photo to the right shows, when things are not compatible, there will be misunderstandings. I prefer the simple "it just works, plug-n-play" option when possible. When you want to plug in and the connector doesn't fit, it is a frustrating experience and makes the entire EV experience less satisfying. If someone in China buys a Nissan Leaf, BMW i3, or Chevy Spark EV and they want to charge it, they have to know where the specific type of charger is or have the right type of adaptor. If there is roadside signage for fast charging. How would you know which type it is directing you to? Second, connectors are expensive. 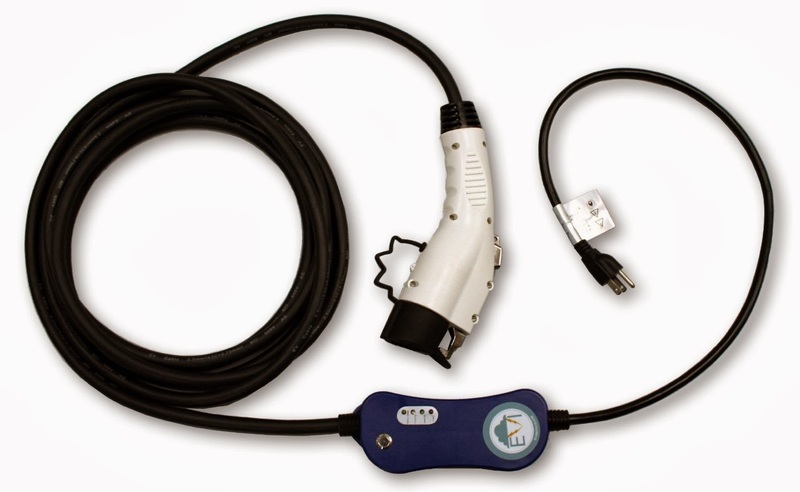 Today, EV charging equipment is expensive, in part, because items that are specific to the EV industry such as charging connectors are still low production volume items. China is potentially a huge EV market. If they would have selected an existing standard, it would have meant more volume and lower prices for everyone using these stations and connectors. This has been done before. 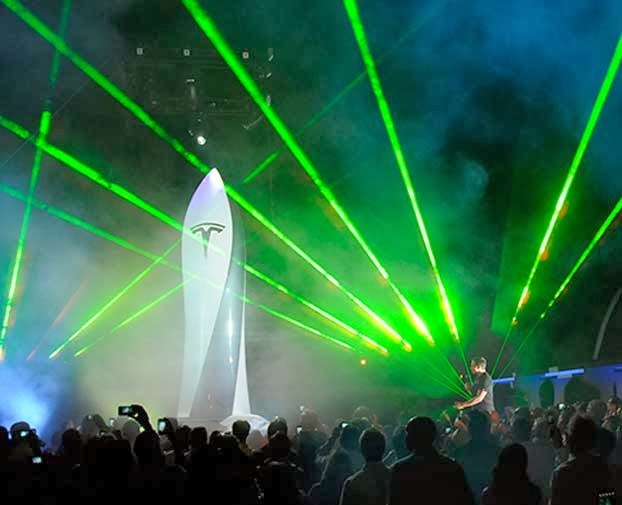 Tesla went out on their own with a proprietary fast charge system they called Supercharger. They are building these Supercharger stations coast to coast in the US and in Europe. Tesla owners are not limited to just Tesla's network. Tesla makes (or will soon make) adaptors to allow Tesla owners to use J1772 and CHAdeMO systems. The adaptors allow Tesla owners to use other networks, but the reverse is not possible. Again resulting in frustrated drivers. During the second wave of EVs (in the 1990s, the GM EV1 era) there were several connector standards. GM and Toyota used induction charging and there were two different sized paddles. While Ford and others used the Avcon connector. This made it difficult to deploy public infrastructure. Which vehicle(s) should you support? Should you deploy some of each? This greatly increased the cost of installing public EV infrastructure. 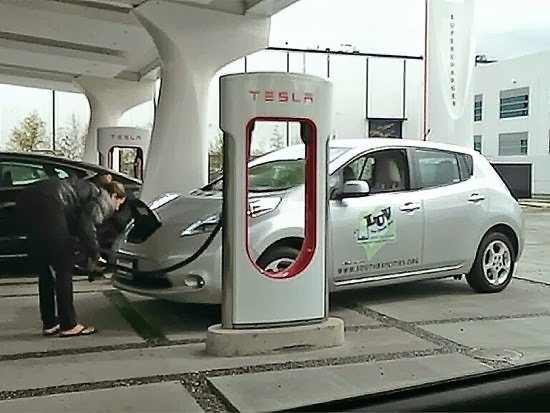 Now, in this generation of EVs, with fast charging, we are making a similar mistake. "Nissan wondered whether a hybrid automobile should sound like tweeting birds. Some manufacturers thought all cars should sound the same, with standardized noises and sound levels, making it easier for everyone to learn how to interpret them. Some blind people thought they should sound like cars—you know, gasoline engines. Skeuomorphic is the technical term for incorporating old, familiar ideas into new technologies, even though they no longer play a functional role. Skeuomorphic designs are often comfortable for traditionalists, and indeed the history of technology shows that new technologies and materials often slavishly imitate the old for no apparent reason except that it’s what people know how to do. Early automobiles looked like horse-driven carriages without the horses (which is also why they were called horseless carriages); early plastics were designed to look like wood; folders in computer file systems often look like paper folders, complete with tabs. One way of overcoming the fear of the new is to make it look like the old." More than 60 companies have signed up for the DOE's Workplace Charging program. Collectively they are installing electric vehicle (EV) charging at more than 150 worksites. Most companies don't provide free gasoline for their employees, so you may ask why they would have any interest in providing electricity for plug-in cars. Here are a few reasons: This could help them attract and retain talented employees that adopt new tech, people that could help the company "see around the corner" and be a market leader. Second, especially when combined with solar carports, EV charging can greatly reduce the carbon footprint of the worksite. Additionally, this can be great PR for the company as an environmental leader. 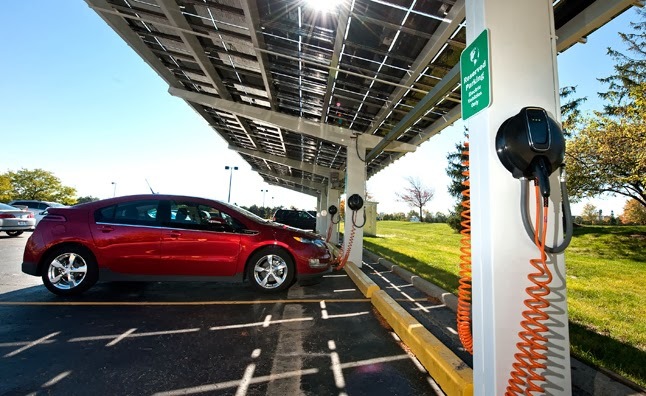 Workplace charging is encouraged by the DOE because it has economic, environmental, and national security benefits for both the employees and the companies that provide it. Having charging stations at work means that employees that don't have access to charging at home, can charge up during the workday and leave with a full charge for their driving needs. It also allows employees with short range PHEVs to drive home on electricity, rather than gasoline. Either as part of the DOE program or not, many workplace charging stations are currently being deployed. In some cases, they are running into complications as demonstrated by the recent "Charge Rage" story. The DOE site has case studies, EV 101 guides, employee survey examples, and much more. These can be very helpful, but I thought I'd share my experience from the perspective of an EV driver that has been charging at work for several years. My worksite has had charging stations for 6 years. During this time we have had a few missteps and we are now on our 3rd charging station provider. I'd like to offer up the lessons I've learned from 6 years of workplace charging. My employer (whom I am not speaking for) is a major high-tech company with offices and factories around the world. They installed charging stations in the late '90s for the EV1 generation of cars. Then in 2008, they dipped their toe back into the pool of workplace charging. And finally, in 2013, they began a nationwide deployment of workplace charging at all their major US sites. Let me paint the picture of how this six year journey began at my worksite. In 2008, the local utility company, Portland General Electric, had a program to encourage workplace charging. The utility paid for the installation of charging stations and for 3 years of renewable energy to power them. The Oregon campus that I work at happened to be the lucky one to get these charging stations. Four Level 1 charging stations were installed and eight EVs could charge at once. In 2008, EVs were a rare sight. Among my EV driving co-workers' vehicles there was a Gizmo, a Sparrow, a Xebra, and a couple conversions. The spots were about 50% utilized and you could always find a parking spot there in the far corner of the parking lot if you needed to plug in. The eight EV reserved spots might have even outnumbered the EVs in the parking lot on most days. EV charging was free and easily accessible. So far so good. In 2011, things changed. The Nissan Leaf and the Chevy Volt hit the streets and they were popular around here. Suddenly it became harder to find a place to plug in. The rare EVs, that were previously lonely in the far corner of the parking lot, now found themselves in a popular place. Circuit breakers in the charging stations started to overload on a routine basis. At the same time other worksites were clamoring for charging infrastructure of their own. It quickly became apparent that the company needed a plan for workplace charging that would be comprehensive and could be used at all major sites. This kicked off a new phase in this workplace charging story. The facilities leaders decided to run a pilot program and learn a few lessons before spending millions by deploying stations across the country or around the globe. Because my campus already had the wiring run for charging stations, we were selected for the pilot. The old charging stations that had been given to us in 2008 were removed. These didn't have the J1772 connector that modern EVs needed and they didn't have a method of collecting fees. One rule that management established for the pilot and any following program is that car charging would NOT be free. As you can imagine, after having free charging for 3 years, some people were unhappy with this change. The wisdom of this decision only became apparent later. The new charging stations were installed. We went from having eight Level 1 charging spots to six Level 2 stations. We went from Free to $1.20 an hour. 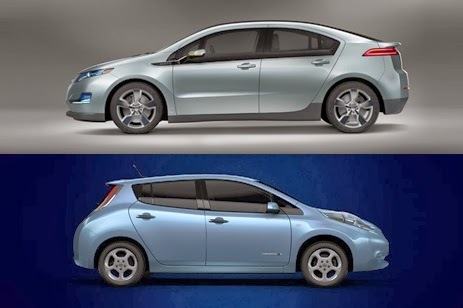 The 2011 Nissan Leaf and Chevy Volt only had 3.3kW chargers. Electricity here is about 10 cents per kWh. This means that these EVs were only able to soak up about 30 cents worth of electricity per hour. Being charged four times the market rate for electricity was not pleasant, especially at work. Yet this was competitive with local public EV charging rates. Blink stations in the area were $1 per hour. The result of this high price (relative to home charging) was that the utilization again dropped to around 50%. Other than an early morning usage spike, you could find a charging station any time after 10 AM, if you needed one. The fact that we were charged by the hour meant that there was motivation to go unplug and move your car after it was done charging. This helped clear up the parking spot for someone else that may need it. Data was collected, usage patterns were analyzed, users were interviewed, and the pilot ended at the end of 2012. The new nationwide program had been determined. The charging station provider and pricing had been determined. Installations at every major campus would begin in 2013. 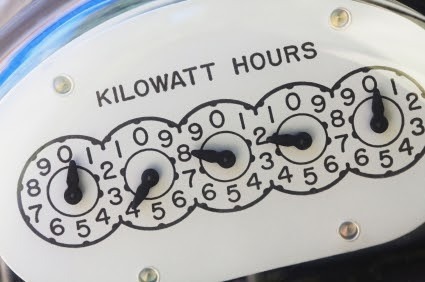 Rather than paying by the hour, as we did in the pilot, the user surveys showed a strong preference to be charged fees by the kilowatt-hour (kWh). This seemed like a more fair scheme since we were only being charged for the energy that we used, but there were unforeseen impacts (more on this soon). During the two years that the pilot went on, a lot more EVs had hit the road: the Tesla Model S came out, the 100,000th EV had been sold in the US, and Nissan even celebrated the 100,000th Leaf being sold worldwide. Plug-in cars were real. They were a small but rapidly growing market segment with sales doubling in 2012 and again in 2013. The West Coast states of Washington, Oregon, and California made up 3 of the top 5 for plug-in cars sales, so adoption here was significant. At my workplace, they installed 11 charging stations in late 2013. This was nearly double the six that we had previously had. This should have improved availability of charging spots. It did not. There were three reasons it became harder to find a place to plug in under the new program. First, the Leafs and Volts had been joined by Think City, Plug-in Prius, C-MAX Energi, Brammo e-bikes, Tesla Model S and more. Now there were over 60 EVs on campus. Simply doubling the number of charging stations while the number of plug-in vehicles in the lot had more than quadrupled was not enough. The next two reasons that it became harder to get a parking spot are perhaps even more important than the growth of EVs in the lot. These two are related to the new program's pricing scheme. We were now being charged 8 cents per kWh. This was cheaper than home charging. This is good for people that cannot charge at home, since they get an affordable place to charge (if they can find a spot). The drawback, however, is that cheaper than home pricing created an artificial demand. Charging at work was 20% cheaper than charging home. Since your car is sitting in the lot all day anyway, some people took advantage of this discount and began charging at work rather than at home for their regular routine. These are people were rarely, if ever, using the stations when they were $1.20 an hour. The second problem with the new pricing was that there was no incentive to move your car after the battery was full. When we were being charged $1.20 an hour, there was a financial motive to move your car when your charge was complete. The new kWh pricing removed this motivation. Once the car was full, the fees stopped. When you are at work, you have meetings, projects, email... It is a hassle to find the time to run out to the parking lot in the middle of the day and then find an available non-EV parking spot. And if the only reason you have for doing it is because someone else may need to charge, it is easy to forget. Our little EV community tried to work together to share our limited charging resources. We encouraged people to use dashboard cards so we could contact each other. We set up an email-list for EV drivers on our worksite. We started a company-wide forum to discuss issues. We made contact lists with our license plate numbers and car description so we could call, text, or email each other if we saw that a car was full and we needed a spot. We established self-regulated AM/PM shifts. This was marginally effective. Since this is a workplace, the same cars are generally arriving each day. This allows us to find the vehicle owners and gently educate them. Just as we started making progress, something unexpected happened. Due to a software glitch, five of the eleven stations had their price set to free. Remember, the stations were only 8 cents per kWh to start with. So "free" was not much of a markdown. But a fraction of the drivers responded like starving college students to a free pizza night. Suddenly, it again became difficult to find a charging spot. People were again complaining in our various forums about the fact that they couldn't find a spot when they really needed it. Each of these assumptions was proven wrong. Enough members of our little plug-in community followed the economics greedy agent model and caused a shortage of our valuable resource, charging availability. This was disappointing. Because of the ratio of EVs to charging stations, it only took a small number of people changing their behavior to disrupt the availability. This illustrated what a difference a few cents can make. This program has case studies and resources to help with planning. It is good PR to get listed on their Partners page. You'll be in good company with companies like Coke, Cisco, Google, Facebook, Dell, and others. Decide if charging is going to be a free perk or not. If it is free, be prepared to install a lot of charging stations. For some level of future-proofing, I would recommend at least one charging outlet for every two plug-in cars on the lot today. The good news about free stations is that they do not need to be networked or to have a method to meter usage or collect payments. This allows you to install significantly cheaper charging infrastructure such as standard 120V 20A outdoor outlets. Standard outlets are not as convenient as Level 1 units with the J1772 connectors, but when they are free this may be acceptable. Level 1 outlets don't charge a vehicle very fast, but cars tend to spend many hours in the parking lot at work, so charge speed it not generally important. Here is an example of a Level 1 unit with the J1772 connector. It is less than $350. This unit (pictured above) is portable, but could easily be converted to a hardwired application. If you don't intend to make charging free, then pricing can be used to deter or encourage charging. I would recommend a rate that is 10% to 25% above the residential electricity rate. A slight premium over residential rates will eliminate artificial demand, while not price gouging people that live in apartments, have long commutes, or otherwise truly need to charge at work. 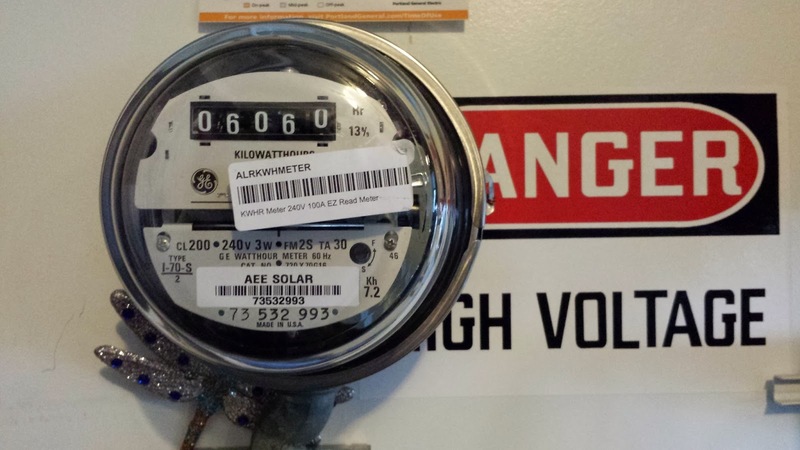 A slightly higher than home pricing scheme will encourage people who can to charge at home. This frees up spots for people that have a legitimate charging need. Encouraging home charging has the added benefit that it will likely be done overnight during off-peak times. This is better for the grid than daytime charging. If you are charging fees, and the fees stop when the charging is done, then the cars will often sit there and consume the access to the charging infrastructure, even after they are full. The easiest way to solve this is to charge by the hour rather than the kWh. Most EVs today have 6.6kW chargers on-board. This means they can add about 6.6kWh at most per hour to the battery pack. If the local rate electricity rate is 10 cents per kWh, this would be a maximum of 66 cents worth of electricity each hour. Adding a small premium to eliminate artificial demand yields a price of 75 cents per hour. My final recommendation is to form an EV community within your workplace. Have a monthly ice cream (or beer) social/fellowship gathering. Establish a place online where the community can discuss issues and share learnings. Have an executive sponsor for EV charging. Hold a ribbon cutting event to show that this is important. Listen to your EV community. Each workplace is a little different and the program may need to be tailored to best meet the needs of the people that are using it. This also ensures that the money spent on this will be a worthwhile investment. Listening to this community will have rewards. If the chargers breakdown, but there is no way to report it, they will go unused and the investment was wasted money. Similarly, if the charging stations are under a sap-dropping tree, where no one ever parks, this was a wasted investment. Having a method of collecting feedback will ensure that the stations can be utilized and meet the goals for which they were installed. "Range Anxiety is now more of an issue for some Internal Combustion Engine (ICE) vehicles powered by traditional Fossil Fuels than for some EVs. According to Chevrolet “Chevy Volt owners that charge regularly are averaging 900 miles between fill-ups” with the help of a range-extending Auxiliary Power Unit (APU). Also the Tesla Model S with the largest battery pack will supply 300 miles of range at 55 MPH, which is already much farther than many Fossil Fuel powered vehicles." Willamette Valley Food & Wine Electric Byway invites you to join us. • Exciting partnerships to be announced soon! Drivers visiting all five locations between April 22-27 will be entered to win an EV powered wine country getaway experience. More details to come! Depending on how your garage is laid out and where the electric breaker box is, it may not be possible to put your home charging station exactly where you'd like it. One possible solution to this is to install a ceiling mounted EVSE extender. 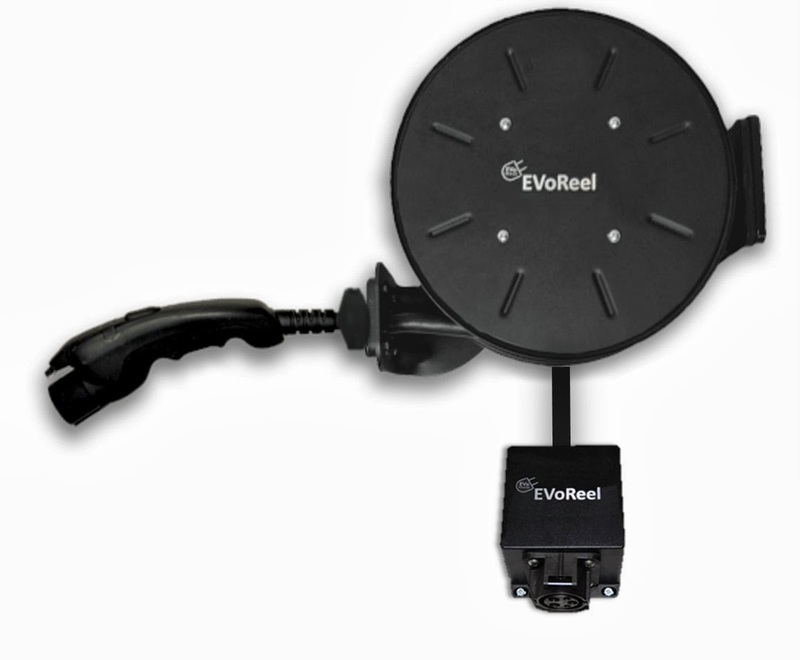 Here is an example of one called EVoReel from Amazon. 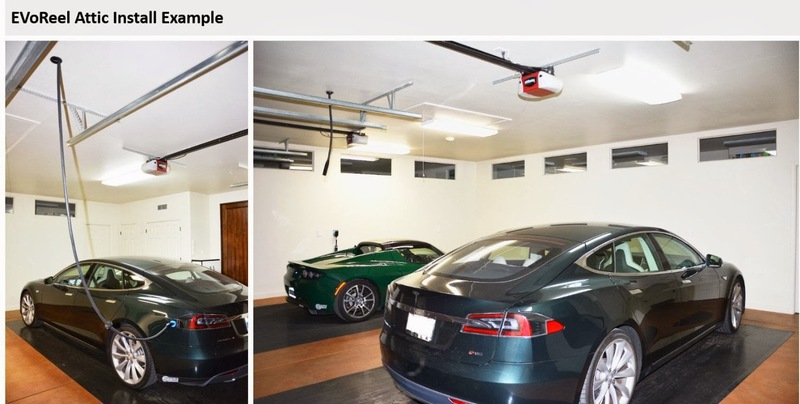 It is also possible to install these in the extenders in the attic above your garage such that all the EVSE hardware, other than the cable and connector, are hidden from view.